Mangaluru, Dec 1, 2015 : Soon after crossing the Kerala-Karnataka border at Talapady on NH66 in to Karnataka, one will get jolted and a very rough ride. Though just a two-lane road, the surface of NH66 in Kerala appears smooth and vehicles move with ease. However, as one crosses Talapady, the road is filled with potholes making the ride dangerous apart from other things. The 2-km stretch of NH66 between Talapady and K.C. 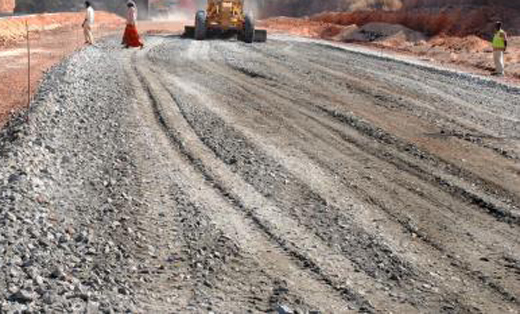 Road appears not to have been maintained properly ever since the National Highways Authority of India (NHAI) took up widening the road in to four-lane about four years ago. Truck drivers who took a break near Talapady can be quoted as saying that the stretch was a challenge for those who drive heavy vehicles as well as light motor vehicles. The stretch of NH66 between Mangaluru and Kerala witnesses heavy movement of vehicles with buses moving at a very high frequency as also trucks. In such a situation, the NHAI should have maintained the existing road in good condition. On the other hand, the work on four-laning the national highway was moving in a slow pace testing the patience of road users. Heavy Traffic : There was bumper-to-bumper traffic during peak hours and the situation was worse if they were caught behind a slow moving vehicle with very little option to overtake it due to constant oncoming traffic said many regular drivers on this road. At least they can complete on side of the road . Especially it is very risky for the two-wheeler’s as they might skid and fall off or lose control on the vehicle.